I read both In the Woods and The Likeness compulsively. The first two novels in Tana French’s loosely connected Dublin Murder Squad series are an emotional wild ride, and also two impressively crafted pieces of mystery fiction. This post will focus more on The Likeness, mainly because I suspect it will stay with me longer. So allow me to start by getting poor In the Woods out of the way. 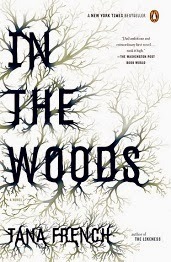 In the Woods is a good novel: I read it in only a few days, and although I never quite warmed up to Rob (and cheered out lout when, in The Likeness, Cassie calls him “a man who wanted me to sleep with him and then punished me because I did”), I don’t necessarily have to like a character to find them or their story interesting. However — and I know this is an odd thing to say about a suspense novel that doesn’t resolve one of its central mysteries — I was left feeling that the story it tells is a little too neat. Rosalind is terrifying because of the effect she has on the other characters, who by then I was emotionally invested in, but she’s also too much of a cipher. I know, I know; there’s a perfectly good reason for that. But it’s a reason that sits a bit uncomfortably with me. I wanted a more detailed exploration of her amorality and lack of empathy than just “some people are born evil”. Despite being left somewhat unsatisfied by In the Woods, I immediately moved on to The Likeness and read it just as greedily. I found it a perfect October read — an impressive feat of suspense and atmosphere — and I can see where the comparisons to The Secret History come from. The premise may indeed strain credibility (briefly, Detective Cassie Maddox looks exactly like a murder victim found in a remote cottage one night, and is thus able to take her place and investigate the murder from the inside. To complicate matters, the woman’s ID has the same name Cassie used as an undercover agent a few years before); but as someone who regularly reads far stranger stories, I had no trouble suspending my disbelief and just going along with it. And yet I was left with mixed feelings once again. My main issue with these novels is that I can’t shake the impression that deep down they have a rather conventional core that doesn’t leave much room for shades of gray. The Likeness is about an eccentric and insular group of graduate English students at Trinity College, Dublin, who live together in a remote and derelict manor house one of them inherited. The four are glamorous in a standoffish and Secret History-ish sort of way, yet Lexie Madison, the murder victim, had somehow managed to join their ranks. Taking her place means that Detective Cassie Maddox gets a chance to see past the impenetrable public façade that Daniel, Abbie, Justin and Rafe put up, and comes to know them beyond the rumours and the gossip. Was the woman calling herself Lexie Madison murdered by one of her closest friends? If so, why? And what is it really like to live at Whitethorn House? The inhabitants of Whitethorn House have eschewed certain aspects of conventionality: they’re five adults living together who confuse people by behaving as if the arrangements is permanent, rather than just a way of making ends meet during their student days; they act like a family unit and haven’t formed any obvious romantic pairings, nor do they seem particularly interested in doing so; they enjoy reading and writing and singing old songs, and they favour scholarship for its own sake rather than as a means to an end. This is all absolutely fine as far as I’m concerned, but I found The Likeness deeply and unsettlingly ambiguous about the group’s choices. There’s a faint air of deviance surrounding them, and this is only strengthened as Cassie gets to know them better. It would be ungenerous of me to suggest that the narrative sides with Rafe's father and his rants: during her time at Whitethorn House, Cassie witnesses one of his recurrent phone calls. Rafe’s father yells at his son and lectures him at length about Behaving Like a Proper Adult and Joining the Real World, about how he’s wasting his life, and about what he sees as his refusal to grow up and Be a Man. He’s a deeply unpleasant man and The Likeness portrays him as such; and yet I was troubled by Abbie’s revelation at the end that Properly Grown-Up Rafe, who is now working in finance or some such, didn’t actually sound unhappy on the phone. It’s possible that Abbie was deliberately misleading Cassie, but the question lingers. I felt this ambiguity even more strongly in how Daniel was portrayed. To be honest, I found Daniel an insufferable prick (my perpetual inability to take anyone who says sentences such as “war in intrinsic to human nature” with a straight face seriously kicked in fairly early on), but what he wants or doesn’t want doesn't actually make him broken or wrong. Daniel is framed as a tragic character, doomed by his fatal desire for impossible things, yet I fail to see how he could be any such thing. Rejecting heteranormative romance and opting for an arrangement where you form strong non-sexual emotional ties with several adults is neither wrong nor doomed by default. There’s nothing deviant about planning to share your entire life with four close friends you think of as family. Daniel’s rejection of the 9-to-5 life is a bit more complicated, in the sense that one can’t easily choose to opt out without being independently wealthy, but again the desire to do so doesn’t make him wrong. I thought that Daniel’s obvious blindspot was focusing so much on finding an individual solution for the very real social and political problem he has identified, but nothing about the concerns he shares with Cassie told me he was doomed to never adapt to this world (as if “this world” were an immutable thing, rather than something we’ve constructed and can therefore challenge and make better), and it worried me that he was presented as such. The novel leaves a lot unsaid about the inhabitants of Whitethorn House and their (slightly by most standards) unconventional lifestyle. Cassie certainly feels its lure, but it seems to me that this is presented a bit like the lure of fairyland — dangerous and foolish and ultimately wrong, no matter how much you think you want it. On the one hand, The Likeness gives us characters like Cassie and fabulous escape artist Lexie aka Grace — complicated women of the kind I perpetually crave in my fiction. On the other hand, what do they turn out to really want in the end? What is presented as the right path for them? Gracie dies when planning one last escape so she could settle down and raise her child; Cassie becomes engaged even though this may mean she won’t be able to return to the Murder Squad. These are, of course, perfectly valid choices for these women to make — it’s how they fit into the narrative’s wider pattern that troubles me. It’s their whiff of righteousness as opposed to the Whitethorn House gang’s supposed unnaturalness that made me uneasy. Is The Likeness a novel where escape from conventionally is treated as a temporary deviation that the characters must eventually find their way back from (or else); or is it a tragic and sympathetic story about the barriers faced by people whose desires don’t neatly align with approved social narratives, such as wishing for 9 to 5 jobs in profitable sectors and for marriage and children? I'm of two minds. I know many of you are fans — tell me what you think? Couldn't read your entire post, since I haven't read The Likeness yet but hope to do so in the future, but I thought what you had to say about In The Woods was interesting. I really enjoyed it (and, like you, read it in a couple of days), but I can see what you mean about Rosalind's sociopathy seeming like an easy way out. On the other hand (at least for me), some of the messiness of the novel's ending had less to do with how tidily loose ends were wrapped up and more to do with a sense that some things can't ever be completely fixed or even understood. I liked that Rob's relationship with Cassie was presented as irrevocably damaged, because it seemed to capture the way minor mistakes (that don't even necessarily seem like mistakes at the time) can snowball into much bigger problems that you don't notice until it's too late. Yes - I can absolutely see that, and it was one of the things I liked too. 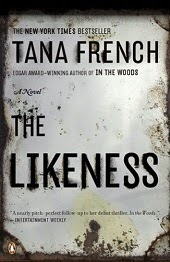 The Likeness explores that too in a way, especially because there are references to the aftermath of the events of In The Woods and its far-reaching consequences. This is a really fascinating post, Ana. I read In the Woods some time ago, and it didn't wow me the way it did most of the blogging world. I've been considering reading one more Tana French book before calling it quits; if I do I'll come back and tell you what I think of your idea about it maybe being super conventional morality. Yes, please come and tell me! I'd so love to hear what you think.